It’s normal to worry about your children — especially if you’re a new parent. Are they getting the right food? Are they too hot, or too cold? Is there excessive stress in their lives? Are they getting too much exposure to the sun? There’s just so much to get right. 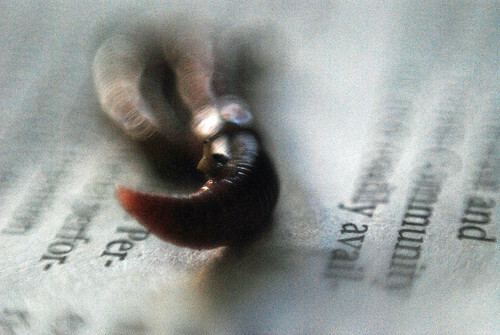 But here’s something that never occurred to me: it seems that it’s normal to worry about your worms too — especially if you’re new to worm husbandry. Until last Sunday, I barely gave worms any thought. Before then, they were just little creatures I avoided stepping on after a good rain. I didn’t have the responsibility of having worms under my care … nor did I face the prospect of nurturing a colony of red wrigglers through its next few generations. That all changed when Bonnie Lee and I attended Dig into Dirt, the first of five Sustainable Sundays events at the Natural History Museum in Los Angeles. We were there to learn about soil, and in the process we learned a whole bunch about worms and composting, something we’ve been meaning to look into for a while. The session started with us handling a few worms, and starting to appreciate what interesting little creatures they are. Mine was feisty, a lovely shade of red, surprisingly strong, and fascinating to watch move. I’m not ashamed to say that I felt a kind of affection for the little fellow-gal (she-he is both, as are all his-her brethren), and a sudden desire to bring a few red wrigglers into my home. Of course, this wasn’t just about discovering an appreciation for worms; keeping worms and composting simply make sense. When you think about it, an ecosystem is an amazing thing. Fed by energy from the sun (usually), it cycles stuff (minerals, carbon, and such) through various forms — forms as fascinating and varied as red wrigglers, Rafflesia arnoldii, naked mole rats, Tiny Tim, and orchid mantises. Whenever we throw things away, we take stuff out of the ecosystem we belong to, and give it to whatever ecosystems thrive in toxic (to us) landfills and sludge. Given how much we throw away, it stands to reason that, eventually, the ecosystem we belong to will run out of stuff; the first thing on that list looks like it will be phosphorus. Worms can be our partners in helping keep the stuff we need to live available for us to reuse. They produce castings and worm tea which you can use in your garden, not only saving you money, but also quite literally turning the things you throw away into food… and they’re kind of cute in their own way. Worms eat one half of their weight every day. You can compost indoors — and no, compost doesn’t stink; it smells sweet. A study of 16 households that compost in Vancouver found that the average household avoided putting 915 pounds of waste in the trash each year. Do you compost? If so, feel free to share tips here — we’ll need them. If not, what’s stopping you? This entry was posted in Taking action and tagged compost, little creatures, natural history museum, On food waste, red wrigglers, sustainability, worms by Jean-François. Bookmark the permalink. We have a composter (that looks pretty much like this: http://www.arboretum.ie/Composter_with_hatch.html ) in our garden. We’ve been feeding it over the past year and a half and through the magic that is compost, it never gets full! One key thing we’ve been told to watch for is to make sure it doesn’t get too wet (add some torn up newspaper if it does) and doesn’t get too dry (hasn’t been an issue for us, but I think you’re to add water if it does). I’m hoping to finally pull some of the delightful products out through the hatch as we prepare vegetable beds this year. Radishes, Carrots and Potatoes ahoy! I wish you much fun with your delightful wrigglers. You guys are in the big league. We don’t have a garden, alas, so are setting up something smaller… at least until we convince the building management to set up something for the whole apartment complex, one of the projects on my to-do list. Wow, that’s way faster than our worms — though a tad more expensive. We ended up getting a drawer system for ours, which will house about 10,000 of the little fellas-gals when it’s humming, enough to convert about 6 pounds of waste into composite a week. We’ll probably have to put up some sort of security to keep the fishermen away.